Help me out here, readers. 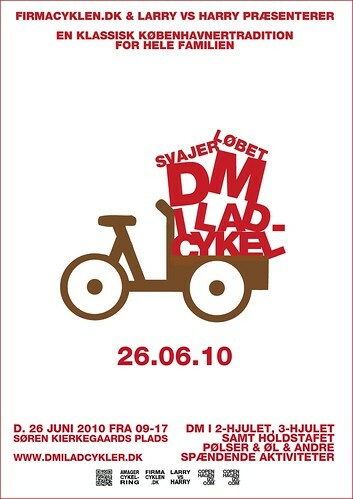 Our other blog, Copenhagenize.com, is proud to be one of the sponsors of this year's Svajerløb - Danish Cargo Bike Championships 2010 on June 26, 2010 here in Copenhagen. 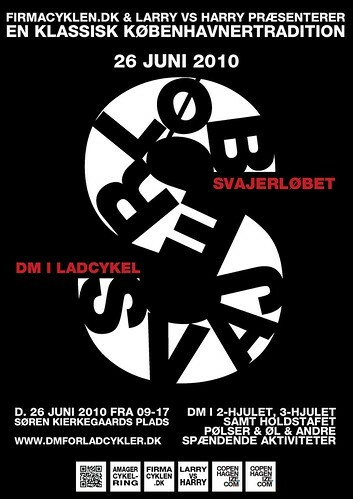 I've been whipping together some rough prototypes for posters and here they are. You're all a fantastic, creative bunch so tell me, which one do you like the best? There's a poll at the end of this post. 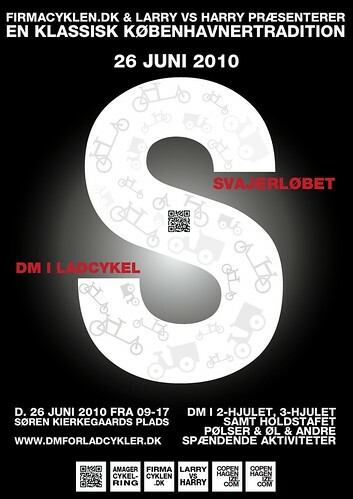 'Svajerløb' is the name of the century old cargo bike races in Copenhagen, raced by the original bike messengers (seven decades before that Kevin Bacon guy in Quicksilver), the Svajere or The Swayers. 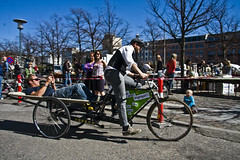 Called such because of the way they swaying way they rode their cargo bikes. They were damn sharp dressers, too. 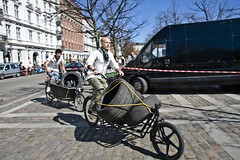 The races are for two-wheeled cargo bikes, three -wheeled and a team relay. 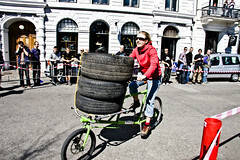 You race around a track and then put a pile of car tires on the bike and tie them down before continuing. Anyway, just look at the designs and give me your gut feeling. They were sharp...the other blog is looking great. Well I voted, as usual in these matters, I am not with the group(s). Oh well. Hi, My comment is not specifically about this post. Just to let you know I had my own cycle chic moment, right here in Portugal, with a Danish girl. We went for a bike ride in the outskirts of Lisbon and I more or less warned her it would be an urban ride, and the best spots would require some mild off-road riding. Because it had rained during the night, we had to go over some mud and water. When we got at the end of the day, her beautiful Burbery's mini-skirt and her Tommy shoes were as clean and tidy as in the beginning!!! There is a fair bit of Weight in those Tyres,Tough going. I would love to have one of those Bulitt Bikes from Larry V Harry. 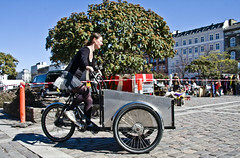 A Bicycle Courier Company has them in Dublin now. I cast my Vote,it would not be Ethical to say which one I chose. also would love to be fortunate enough to have a steed to commute with! i'm working on a poster for a similar event here in portland. that trike-full-of-type design is fabulous. Awesomeness on this blog, as always!